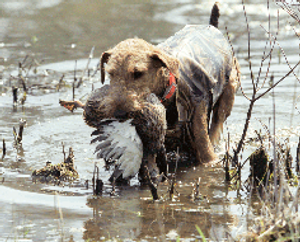 We're proud to showcase the many Airedales that have earned their titles, achieving different levels of awards ("working hard" with their handlers & owners!). 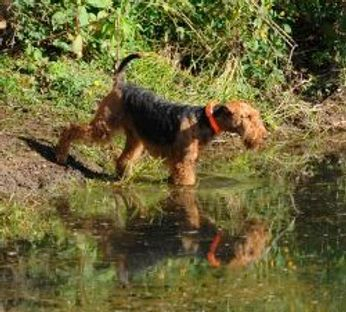 HWA always welcomes newcomers to attend our events & workshops (with or without their 'dales) – where you can learn more about how to get started, and see Airedales in action and get the "hands on" experience. 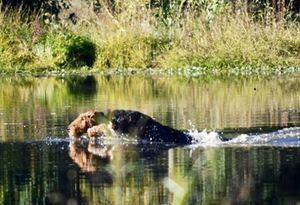 Check back soon, to see even more titled dogs as we keep adding them to our website showcase! 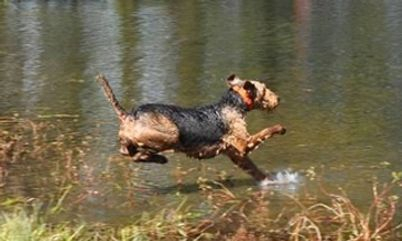 Libby earned her AKC Junior Hunter title on September 1, 2018. 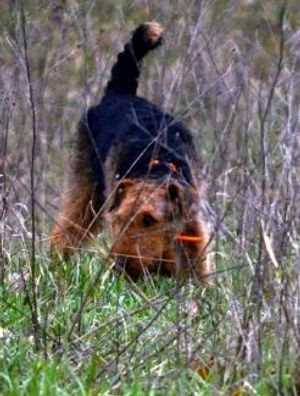 Triumph earned his AKC Junior Hunter Title on May 20, 2017. 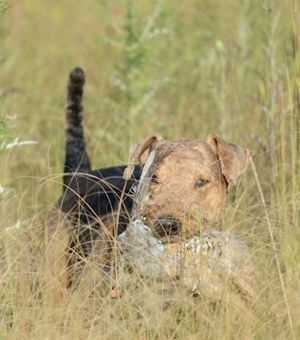 Laser earned his AKC Junior Hunter Title on August 27, 2017. Euro is handled by his owner, Linda Sorak. Euro earned his AKC Junior Hunter Title on September 23, 2017. 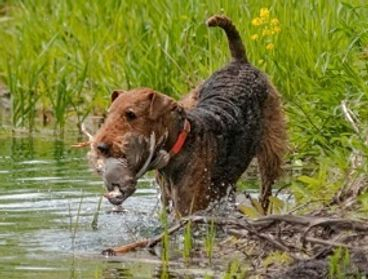 Mike earned his AKC Junior Hunter Title on May 20, 2017. 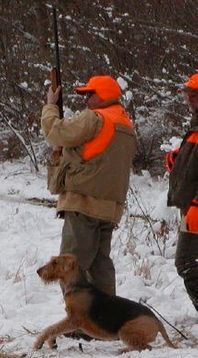 Mike is handled by his owner, Chris Halvorson. 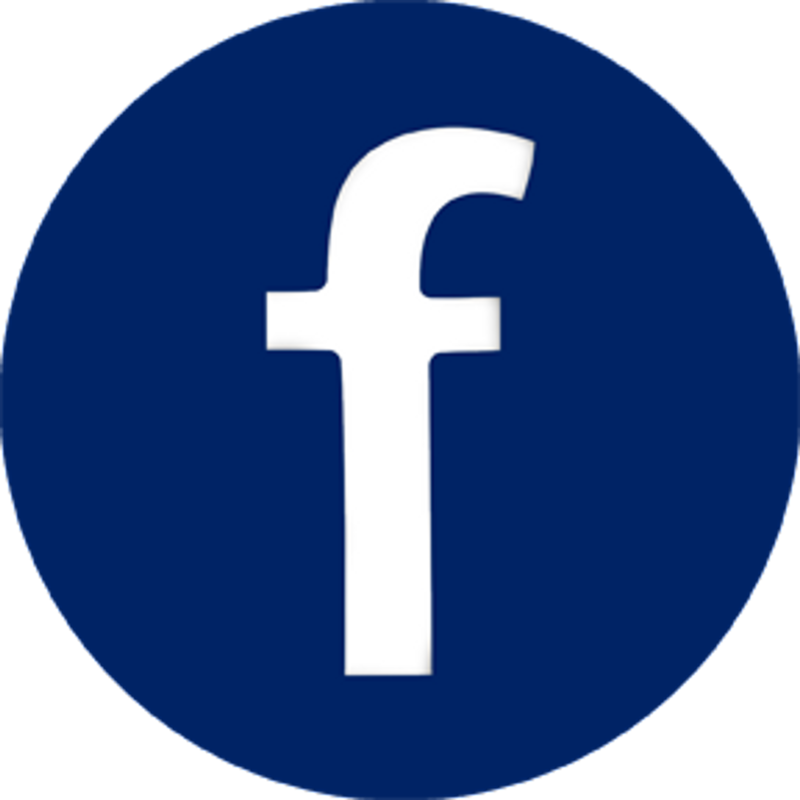 Paladin earned his AKC Junior Hunter Title on June 5, 2016; his HRC Started Hunting Retreiver title on April 23, 2016; and his AKC Senior Hunter in June 2017. Emmitt earned his AKC Junior Hunter Title on August 28, 2016. 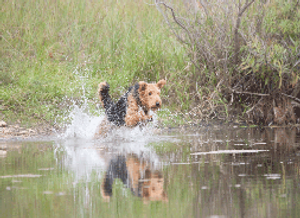 Dog's Call Name: "[Dammit] Emmitt"
Filson earned his AKC Junior Hunter Title on October 5, 2014; his AKC Senior Hunter tItle on May 7, 2016; and his AKC Master hunter title on October 28, 2017. May 17, 2014; his AKC Master Hunter Title on August 28, 2016; and his MHV title at HWA's 2017 Nationals. 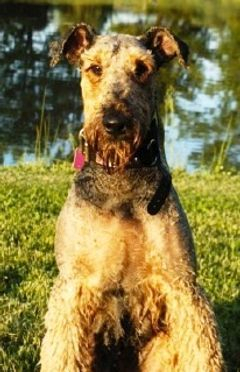 Kasbah earned her AKC Master Hunter Title on July 23, 2016. 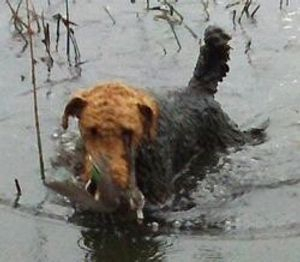 Scarlett earned her HRC title of Hunting Retriever on April 22, 2018. 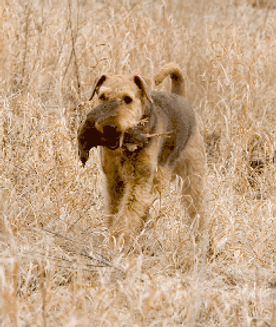 She is the first Airedale to earn that advanced title. Scarlett earned her AKC Master Hunter title on October 29, 2016. 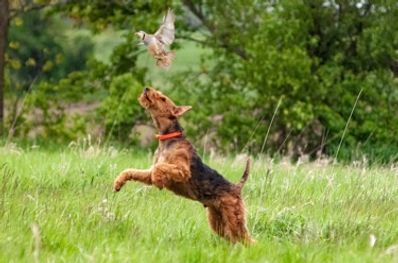 Kira earned her AKC Senior Hunter Title on Sept. 1, 2013; her AKC Master Hunter Title on July 22, 2016; and her MHV title at HWA’s 2017 Nationals. 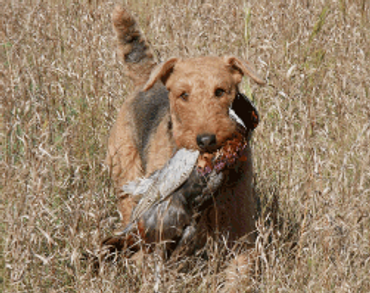 Lou earned her AKC Junior Hunter Title on Sept. 7, 2013. 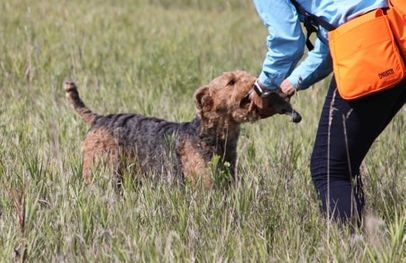 Izzy earned her AKC Junior Hunter Title on May 18, 2013. 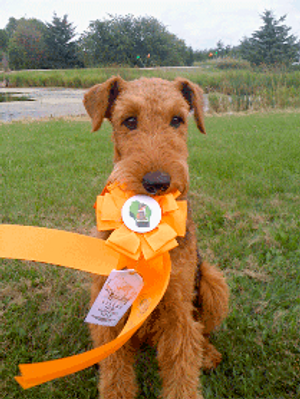 Willow earned her AKC Senior Hunter Title on August 18, 2013. Willow is handled by her owner, Matthew Nordahl. 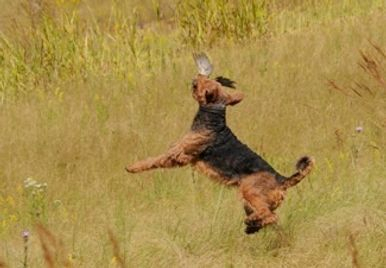 Pete earned his AKC Junior Hunter title on September 9, 2012.
at the ATCA's Cooley Memorial Hunt Test. 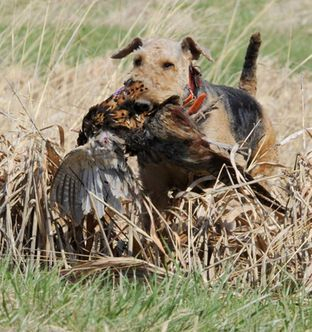 She also completed her Master Hunter Versatile (MHV) title by earning her Master Hunter Fur (MHFur) title. 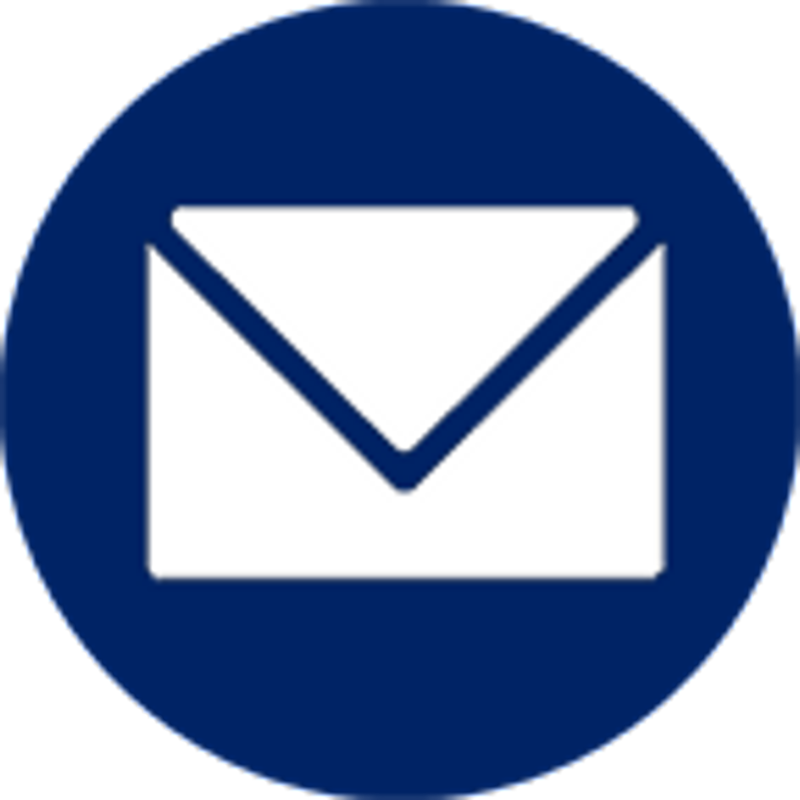 U-CDX Connemara's Lustrous Gem, Vermillion Streaming Jet MH (AKC), MHV, CDX, RE, NA, NAJ, CGC. 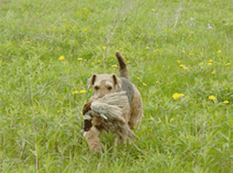 Force earned his AKC Junior Hunter title on May 19th, 2013. 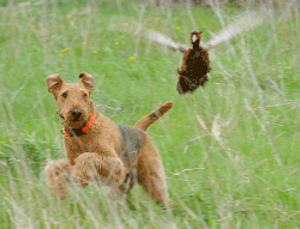 Club weekend, during the ATCA's first sponsored hunt test on Oct. 3, 2009. 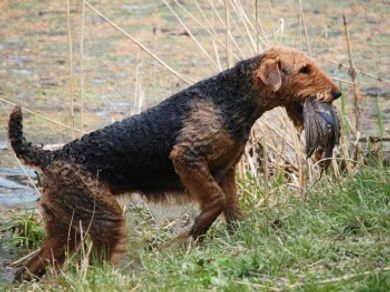 Kaleigh earned the first Master Hunter Title awarded to an Airedale on August 8, 2010. 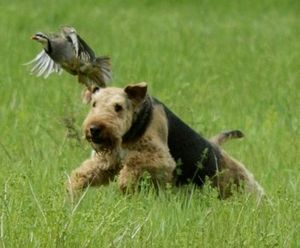 AKC Senior Hunter title on May 20, 2012. 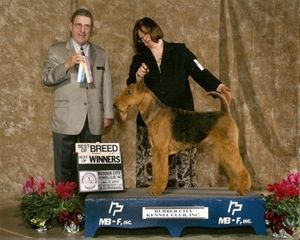 Bob earned the first AKC Hunt Test Title awarded to an Airedale on Sept. 6, 2009. 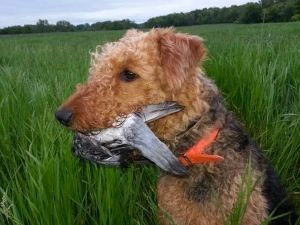 Kodi earned his AKC Junior Hunter Title on May 19, 2012. 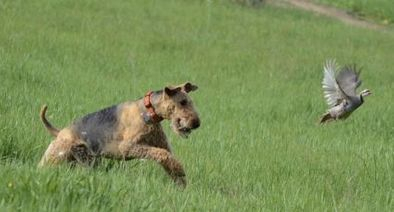 Payton earned her AKC Senior Hunter Title on Oct. 18, 2009 and earned her Master Hunter title in 2012. 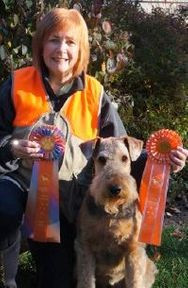 Tulla earned her AKC Senior Hunter Title on October 21, 2012.